With the goal of harnessing the untapped potential of Iranian-Americans, and to build the capacity of the Iranian diaspora in effecting positive change in the U.S. and around the world, the West Asia Council has launched a series of interviews that explore the personal and professional backgrounds of prominent Iranian-Americans who have made seminal contributions to their fields of endeavour. We examine lives and journeys that have led to significant achievements in the worlds of science, technology, finance, medicine, law, the arts and numerous other endeavors. Our latest interviewee is Behzad Razavi. Behzad Razavi is Professor of Electrical Engineering at University of California, Los Angeles, where he conducts research in the area of microelectronics and microchip design. He has published seven books and more than 180 papers in the field and has received eight IEEE best paper awards and four teaching awards. His books have been published in seven languages. His youtube lectures on electronics have been watched more than 150,000 times. Professor Razavi was recognized as one of the top 10 authors in the 50-year history of the premier conference in the field, IEEE International Solid-State Circuits Conference. He has served as an IEEE Distinguished Lecturer and is a Fellow of IEEE. In 2012, he received the IEEE Donald Pederson Award in Solid-State Circuits, the highest award accorded to a person in the field of microchip design. For more details, please click (here). May we start with you giving us some brief biographical information? I was born in Esfahan, Iran, and received my BSc in Electrical Engineering from Sharif University of Technology, Tehran, in 1985 and my MSc and PhD in Electrical Engineering from Stanford University in 1988 and 1992, respectively. I worked at AT&T Bell Laboratories and Hewlett-Packard Laboratories for four and half years and joined UCLA in 1996. Three key places that have shaped my career are Sharif University, which gave me a solid footing in fundamentals, Stanford University, which taught me how to do original research, and AT&T Bell Laboratories, which showed me how to grow as a researcher. I have also been influenced by the thinking of the late great theoretical physicist, Richard Feynman, especially by his book, The Pleasure of Finding Things Out, which was published in 1999 and is a collection of his short works including articles, speeches, interviews, and lectures. Indeed, the pleasure of discovery has been a driving force for me. What made you choose an academic career over industry? Tell us about the biggest challenge you faced as an academic, how you overcame it, and what you'd do differently now? What do you most appreciate about academia? What has been the best part of your career so far? Since high school, I liked teaching and sharing my knowledge with others, and had decided that I would become a professor. I did not know at the time that a professor conducts research, too, but that became another attractive aspect for me as I went through college and graduate school. The greatest challenge for an academic is making sure that his/her PhD students succeed in their research. The open-ended nature of research often presents many uncertainties that may impede progress, an issue that the advisor appreciates more than the student. With research sponsors expecting to see results, the advisor must constantly shield the students from the pressure and yet propel them toward ground-breaking outcomes. I have dealt with this challenge by careful screening of student applicants and trying to stay ahead of the schedule. In addition to serving as a place for teaching young minds, academia also offers more freedom in research - but with more limited resources than one would find in industry. Going back to "Pleasure of Finding Things Out," I vicariously enjoy the discoveries made by my students - and the fact that academia continues to bring in fresh blood. 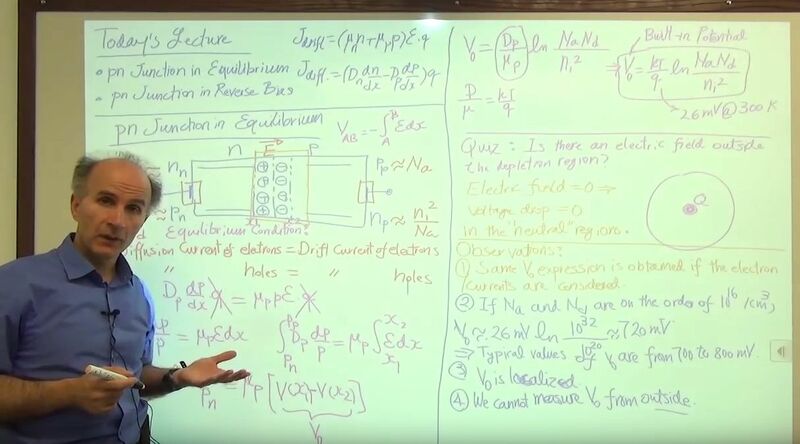 The best part of my career has been teaching hundreds of thousands of students and engineers around the globe through my books, research papers, and youtube videos. Your lab conducts research in the area of high-speed analog and RF circuits. Could you please identify a couple of research articles that you value as of high importance produced by your lab? B. Razavi, "Design Considerations for Direct Conversion Receivers," IEEE Transactions on Circuits and Systems, Part II, vol. 44, pp. 428-435, June 1997. B. Razavi, "A Study of Phase Noise in CMOS Oscillators," IEEE Journal of Solid-State Circuits, vol. 31, pp. 331-343, March 1996. Your research and teaching interests include Analog, RF, mixed-signal integrated circuit design, phase-locked systems and frequency synthesizers, A/D and D/A converters, and high-speed data communication circuits. Could you please shed light on some research that has made significant contributions to your fields of interest? In general, the novel work done in my lab on raising the speed of microchips or lowering their power consumption has been received well by our technical community. Examples include work on circuits pushing for a data rate of 40 Gb/s back in early 2000s and, more recently, reduction of the power of high-speed circuits by an order of magnitude. When one considers that each of the 100,000 servers in a Facebook data center uses these circuits, one appreciates the importance of power reduction. I dare say that every email sent out today is likely to go through a circuit topology developed in my lab. What are your research goals in the coming 5 to 10 years? Is there anything specific you would like to achieve in your career? I believe wireless technology will continue to present interesting challenges as it permeates our lives and our livelihood. This, together with the problem of building tens of thousands of green data centers around the world, will provide fertile grounds for research. Most of the awards and recognitions received by my students and me relate to the field of high-speed, low-power communication circuits. Our objective has always been to develop new, elegant ideas that solve difficult, real problems. I ask my students to aim for landmark leaps rather than incremental improvements. Our field changes in response to - or to create - a need for new products, new ways of doing things, new user experiences. The fundamentals haven't changed much: we must always target a higher performance, a lower cost, and/or new functions, but within the confines of new device technologies. I am excited to see that increasingly more sophisticated microchips will monitor and report, wirelessly, our activities, whether we are awake or not. The massive knowledge thus gained will help the medical community to identify clearer causalities and find cures for many of our ailments. To what extent have you been involved with the Iranian-American community? This seems especially pertinent since you teach at UCLA, named after a city that is known as "Tehrangeles." How do you see the impact of Iranian-Americans on your field, both in academic institutions and industry? It is interesting that the field of microelectronics has benefited from many Iranian-Americans - both in academia and in industry. When I go to our major conferences, I see that a significant number of the authors and the attendees are Iranian-American. These conferences provide a great networking opportunity for all of us. Since you graduated from Iran's leading technical university (Sharif University of Technology), have you kept in touch with that institution, and do you engage in academic collaboration with colleagues in Iran? I visit Sharif University almost every year and catch up with my professors and colleagues. In fact, this year marks the 50th anniversary of Sharif's establishment, for which occasion the university recognized 50 distinguished alumni among its 48,000 graduates. It was an honor for me to be included among the 50 and to participate in the celebration.